Your business can plan for this known cost increase. 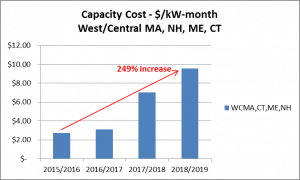 Planned electricity generation plant closures through 2018 will result in a reduction of over 3,500 mega-watts of electricity for the New England region. This electricity deficit has already been reflected in the increased capacity market prices. 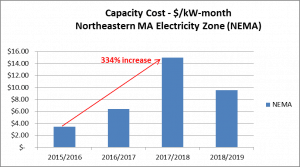 Capacity costs (a major component of electricity prices) began to escalate in June of 2016. View our quick 5-minute video on capacity cost increases in New England and what your company can do to reduce costs and mitigate risk. 888.686.4845 or complete the form. 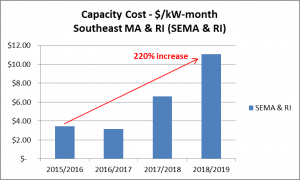 Click here for more detailed information on capacity costs in New Hampshire, Maine, Massachusetts, Connecticut and Rhode Island.